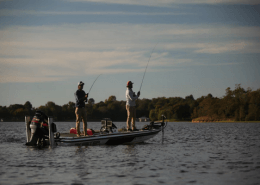 Getting out on the water for a fun filled day is oftentimes one of the best things to do to get out and enjoy the weather during those warmer months. One of the fastest growing ways to spend this time on the water is with the use of an inflatable kayak. These kayaks come in all shapes and sizes but one of the most popular kinds are the tandem inflatable kayaks. These kayaks are great because they allow two people to easily and comfortably fit inside and paddle around. This is a great way to spend an afternoon with friends and family. 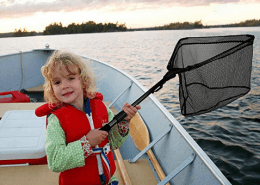 Whether that be simply paddling around the lake for some afternoon sightseeing or hitting all those hard to reach honey holes for some evening fishing. These tandem kayaks are great for countless activities, this is one of the biggest reasons why these things are flying off the shelf as fast as they are. Another amazing feature associated with inflatable tandem kayaks is their ease of transport. You can easily deflate them, fold them up and throw them in the back of any vehicle. Simply pull out your inflatable hand pump and a few minutes later you have yourself a fully functional tandem kayak, ready for anything. If you’re on the market for an inflatable kayak or you’re just curious what the top tandem inflatable kayaks are, you’re in luck. Here are our picks of the best inflatable tandem kayaks for the money in 2019. 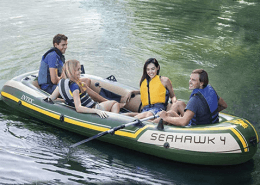 The Intex Explorer K2 Kayak is an inflatable tandem kayak that measures 10’3″ x 3′ x 1’8″ when fully inflated. It has a low profile, making it suitable for use in calmer waters like mild rivers and lakes. It is meant to safely carry two people weighing a maximum of 400 pounds in total. Included with the tandem kayak set are 2 adjustable seats with backrests. If you prefer to sit directly on the boat, the seats are removable as well. 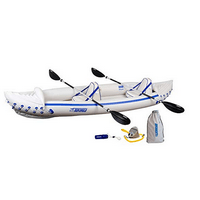 This inflatable tandem kayak is made of the same durable vinyl that Intex is famous for. The floor is especially rigid yet comfortable because of its inflatable I-beam design. Grab handles are available on both ends and so are grab lines. 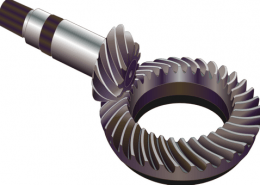 It also has a removable skeg for directional stability. The bright yellow coloring doesn’t only make it attractive but it also makes it highly visible in case of an emergency. This tandem kayak has been certified by the NMMA using ABYC standards and has also been approved by the TUV. 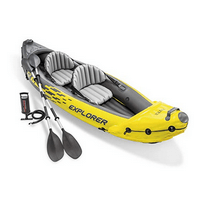 The Explorer K2 comes with 2 aluminum paddles that are 86 inches long. Also included is a high-output pump which quickly inflates and deflates the boat using the Boston valves found on each side. Additionally, it includes a repair kit and a carry bag. 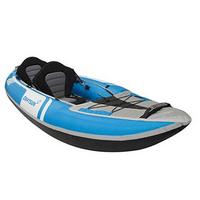 The Sea Eagle 370 is an inflatable tandem kayak that has a Class III whitewater rating. It can accommodate a total weight of 650 pounds. Although that’s more than enough for 3 average-sized adults (plus gear), it only includes two inflatable, movable, and removable seats. Nevertheless, it measures 12’6″ x 2’10” and so has ample space for everyone. While it’s sturdy enough for 3, the Sea Eagle 370 Inflatable Sport Kayak can still be easily transported, inflated, and used by a single person. Its hull is made of a PolyKrylar material that’s safe from puncture, even from your dog’s claws. 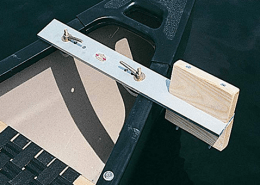 It is also designed with 3 chambers and the seams are high-frequency welded so the entire kayak is essentially a single solid piece. Additionally, the flooring has an inflatable I-beam construction, making it rigid as well as comfortable. 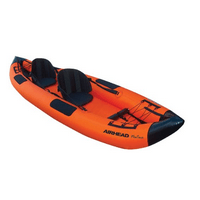 The Sea Eagle 370 Inflatable Sport Kayak grab lines on both the bow and the stern. It also has two rear skegs so it tracks smoothly. Also, it has 5 deluxe one-way valves as well as a self-bailing drain valve. It is inflated with the included foot pump. It also comes with two 7’10” 4-part paddles, a carry bag, a pressure gauge, and a repair kit. This tandem kayak is NMMA-approved. 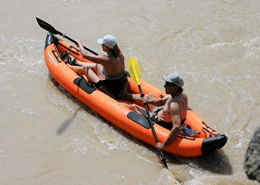 The AdvancedFrame Convertible Inflatable Kayak by Advanced Elements is 15 feet long and 32 inches wide. With a maximum capacity of 550 pounds, it can safely carry 2 adults but is also suitable for use by only one person. 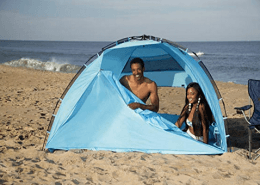 It comes with 2 folding seats but accommodates 3 seat locations so you can take the center on solo trips and use two other configurations for tandem trips. One of the most important features that sets this inflatable kayak apart is its hull, which has built-in aluminum ribs. It is remarkably durable because it is made with 3 layers of puncture-resistant material. It features the Advanced Elements spring valve and has a pressure relief valve that’s built into the flooring. It however, isn’t self-bailing. 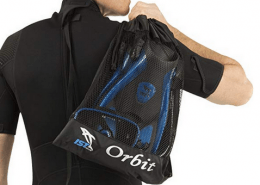 Apart from the two folding seats, the Advanced Elements AdvancedFrame Convertible Inflatable Kayak comes with a carrying bag and a repair kit. Although it doesn’t come with a pump, it’s compatible with any dual-action pump. 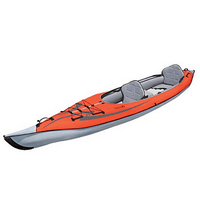 Additionally, because of its AdvancedFrame Convertible design, you can purchase conversion kits that will easily turn this kayak into a closed single deck or double deck. The Voyager 2-Person Inflatable Kayak by Driftsun is 10 feet long and 35 inches wide. Its recommended weight limit is 450 pounds, which allows it to safely carry 2 adults plus gear. It comes with 2 EVA-padded high back seats that are adjustable as well as removable. 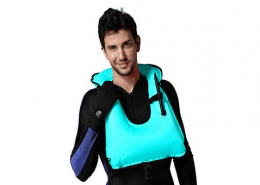 The Driftsun Voyager 2-Person Inflatable Kayak is has a tough top cover that’s made of 840D coated nylon oxford fabric, which makes it resistant to rips and tears. The bottom of the kayak is made of heavy-duty PVC so it’s safe from puncturing. It has Boston valves that are guaranteed not to leak and also make it easy to inflate and deflate quickly. Deflated, it measures 26 x 16 x 8 inches and weighs 27 pounds. For travel convenience, it comes with a carry bag. Apart from the seats and carry bag, it comes with 2 aluminum paddles, a dual-action pump, and a removable tracking skeg. Whether in calm or choppy waters, this 2-person inflatable kayak performs very well due to its pointed nose entry, continuous rocker profile, V-shaped hull, and removable tracking skeg. With this kayak there is no need for a kayak roof rack, but if you have one already you can place this inflatable kayak on it as long as its strapped down and you’re good to go. No hatches or pockets for personal items. The 2-Person Inflatable Kayak by Airhead Montana is 12 feet long and is rated to carry a load of up to 500 pounds. As such, it is best suited for 2 adults and even comes with 2 inflatable and adjustable seats with backrests. It also has D-rings on both ends to secure personal items of both paddlers. For the comfort of the paddlers, this inflatable kayak has an adjustable foot brace and neoprene elbow guards. Also, its grab handles make it easy to maneuver in and out of the water. The Airhead Montana 2-Person Inflatable Kayak is made of a tough 840D nylon that’s coated for UV protection as well as water resistance. The bottom has a triple-layer construction to guarantee safety and durability. It has 3 air chambers and is easy to inflate and deflate, owing to its 3 Boston valves. It also has 4 fins at the bottom offer superior tracking. When dry, the kayak weighs approximately 36 pounds. Although it doesn’t come with a carry bag, it does come with straps that wrap around the rolled-up kayak to make it easy to carry.